The obverse of the coin depicts a horse rider with an ulak in his hands. The dynamics of the game is reflected in the lines which gradually turn into the contours of the mountains. 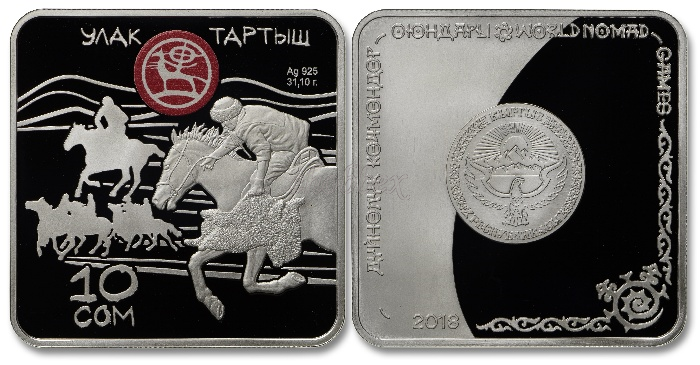 The upper part of the coin contains a colored logo of the World Nomad Games and the name of the coin «Ulak Tartysh» written in the runic style. The left part of the coin illustrates silhouettes of a horse rider and players involved into the game. The weight of the coin (31.10 g) and alloy of metal (Ag925°) are shown in the right part of the coin. The face value of the coin is given in its lower part. The central part of the reverse side of the coin illustrates the coat of arms of the Kyrgyz Republic. There is an inscription «Дүйнөлүк көчмөндөр оюндары /World Nomad Games» around the circumference of the coin. The year of coin issue (2018) is stated in the lower part of the coin.